The TLex Electronic Dictionary software module is a complete, customisable solution for publishing your dictionary electronically - as a CD-ROM, or for sale or download on the Internet, or both. The "base package" provides all the functionality of a modern, user-friendly Electronic Dictionary, but can be fully customised for the desired 'look and feel', branding (e.g. logo), dictionary content and language(s) of your product. This provides a highly cost-effective solution for creating a professional Electronic Dictionary product, obviating the need for the kind of expensive custom-developed solutions that have traditionally been required in the past. Please note that because each project involves its own custom requirements and development, it's not possible for us to offer a single 'standardized price'. However, a 'basic' electronic dictionary (with the features below, but minimal further customization, and no custom "skin") typically starts at approximately 1000 to 2000 Euro. Any cost over and above that would be based on an estimate of the required costs (e.g. programmer hours at our standard rates, or design, if/as applicable). Contact us for a quote! 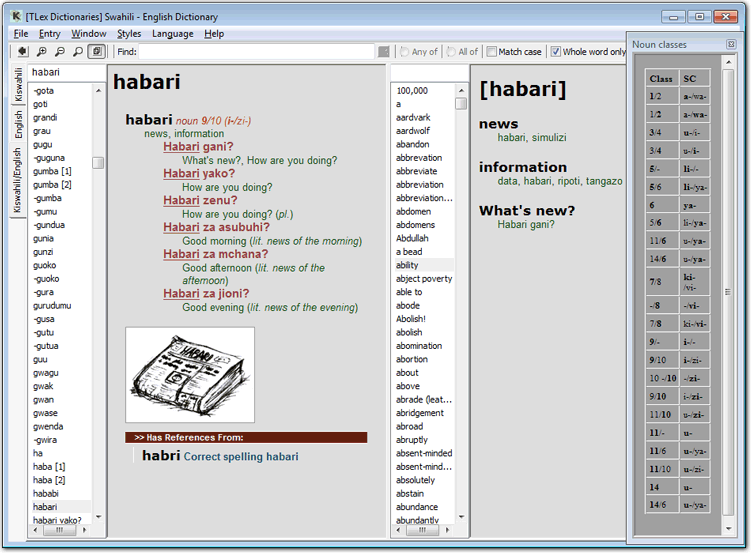 Sample Electronic Dictionary screenshot. This CD-ROM product was developed by TshwaneDJe for Oxford University Press (Southern Africa), and includes Games and Exercises, Microsoft Word integration (AutoFind/"Genie"), study pages, pronunciation recordings, images and more. Please contact us if you would like further information about the TLex Electronic Dictionary system. The system can be used to publish dictionaries already in TLex format, or if you have dictionary data in any other format, we have extensive experience converting many kinds of dictionary data to structured XML-based formats for use in TLex. All aspects of the "look and feel" of the Electronic Dictionary can be customised for each product; e.g. your own logo, icons, product name and so on. The entire interface of your Electronic Dictionary can be translated to, and made available in, any language. The default language may also be changed. Thus for example, the interface of a bilingual French-English dictionary could be available in both French and English, with French being the default. Instant "real-time" switching of the language allows the interface language to be changed by the end-user without even restarting the application. Taking localisation further, the metalanguage of the dictionary content may also be localised. The user may opt to see labels like "noun" or "verb", or words such as "SEE" in cross-references, in the language of their choice. For instance, a Zulu-English bilingual dictionary could allow the user to view such labels in either Zulu or English, depending on their mother-tongue or preference. Part of the standard functionality of TLex is the ability to have images and sound recordings (e.g. pronunciation recordings) in dictionary entries; this carries through to the Electronic Dictionary software. The Electronic Dictionary integrates into Microsoft Word, and will automatically perform a search for the word at the current cursor position; if found, it displays a miniature version of the article (headword plus Translation Equivalents) in an overlay window. When these "mini" results are clicked on, the full article is opened in the main Electronic Dictionary window. This functionality also extends to Outlook when using Word as the e-mail editor. The screenshot below shows this functionality in our Swahili - English Electronic Dictionary. Smart pre-indexing allows for high-speed searching even with large datasets. Further, the ability to configure a search script using the built-in scripting language of TLex allows the search behaviour to be customised for language-specific search functionality (e.g. decomposition-based searching for Nguni languages). The use of smart indexing for searches combined with "memory-mapped I/O" for data accessing allows even large dictionaries to load quickly and to be searched quickly. [Optional] For a bilingual dictionary, this feature allows the end-user to automatically display entries that are related to the current one by means of a shared Translation Equivalent (e.g. "doctor" in the screenshot below). [Optional] For a bilingual dictionary, this feature allows the end-user to automatically display entries on the other side of the dictionary that are related to the current one by means of a Translation Equivalent treated as a headword on that side. For a bilingual dictionary, the end-user may choose to see both sections of the dictionary simultaneously in a split "side-by-side" view, or to "expand" a specific section, giving more space. In addition to a traditional application installer, the TLex Electronic Dictionary software also includes the facility to be able to automatically update itself over the Internet. This is divided into two "levels": Updates for the software itself, and - optionally - updates for the dictionary content. Updates may also be tied to the registration key / license key system (copy protection), e.g. it can be configured to fail if an end-user attempts to update from a copy of the software that does not have a valid license. In a TLex Electronic Dictionary, dictionary data is protected by default with encryption, thus protecting it from potential "intellectual property thieves". A license key copy protection system also prevents casual piracy. The Styles system of TLex allows the appearance (e.g. 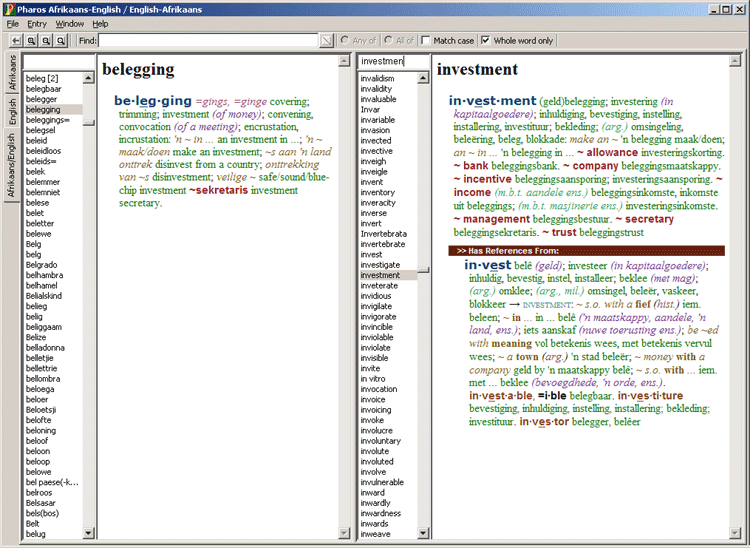 colour, font, surrounding punctuation) of each field in a dictionary to be configured. Preconfigured "sets" of styles, or "views" of the data, may also be prepared for the end-user to choose between, e.g. "advanced" or "novice" views. Different fields may also be visible/hidden in different views. Each field type in the dictionary may optionally be linked to a popup "help screen" that is displayed to the user when clicking on that field. This behaviour is scriptable using the scripting language built into TLex, allowing the popup help screen to exhibit some "intelligence" - e.g. different information could be displayed depending on the value of a particular field (e.g. "noun" vs. "verb"). An icon in the System Tray provides convenient access to the Electronic Dictionary for end-users. A configuration option also allows the Electronic Dictionary software to be loaded into memory at start-up time, allowing the dictionary to be immediately available with no delay. Runs on Windows and Apple Mac OS X. We can offer very fast product development turn-around time. Thai - Swedish Electronic Dictionary Screenshot. Data Copyright Fredrik Almstedt. 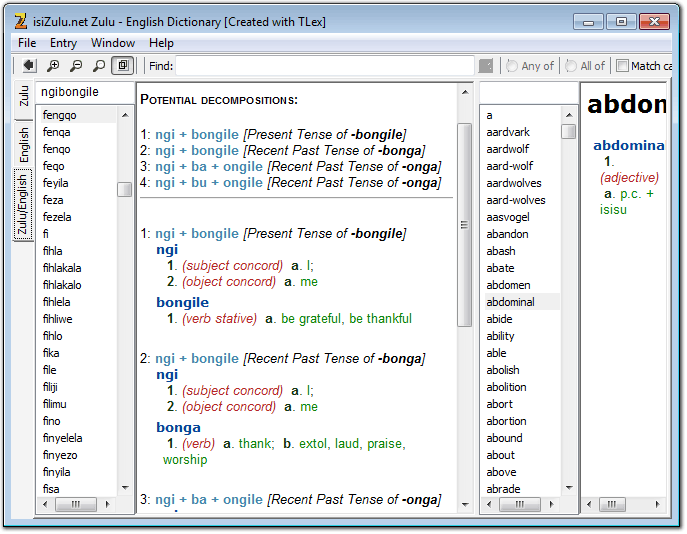 Electronic Dictionary screenshot (Zulu - English / English - Zulu). Data Copyright isizulu.net. Electronic Dictionary screenshot. Data Copyright Pharos.